As I've mentioned before, I always seem to be on the road for Christmas so it is hard to settle into decorating for the season. However, I do have a little Christmas box with my Charlie Brown Christmas tree (from the dollar store) and a few ornaments to dress it up. It definitely belongs in our sealaura world because it's a good little traveler and a great way to have an instant Christmas wherever we are. My other way of decorating is with nature such as this branch you see above in our kitchen. I bought the branch for 2 bucks at the Christmas tree lot and of course I had to purchase my usual Trader Joes wreath for that wonderful Christmassy smell. Lastly, I set up my shell lights and voilà! Suddently it's beginning to look a lot like Christmas! I do dream of someday having a big Coastal Christmas tree and hope to decorate with some sea creatures, such as these lovely ones I spotted at the Monterey Bay Aquarium. If only I were super crafty I would love to know how to make these sweethearts. Maybe I'll see if etsy has something similar... Either way, there you have it a little bit of Christmas at sealaura headquarters. What's your easy way of decorating for the holidays? Everything looks great Laura!!! love the ornaments and the wreath! the crochet sea creatures are amazing! i would have been so tempted by those...and i don't even have a tree! (like you, we are "on the go"). i do like your idea, a little tree that's travel-friendly. that would be my easy way to decorate. one year in the bvi, our tree was a dead potted bougainvillea! sounds pathetic but it was quite fun and simple; a good conversation piece, as you can imagine. I'm loving the mini tree! I adore these crochet sea creatures too..., who knows maybe one day I'll start knitting and crocheting (hope that's spelled right...). Your decoration pieces looks great and never ask for my decoration. Because I never could make time for any decoration. 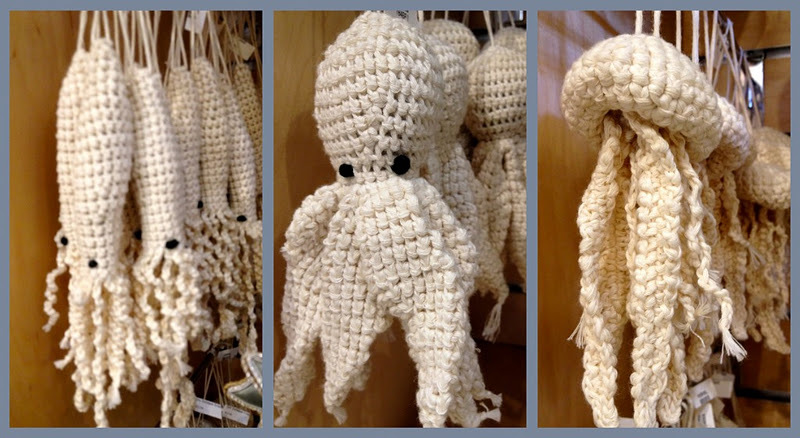 Those knitted sea life ornaments are so fun. Small trees are the best aren't they? Such cute crocheted creatures. I love sea animals. My neck is messed up but it will have to wait till Friday. I swear sometimes I feel like I walk around with a broken neck. Your seashell lights are glorious, Laura! 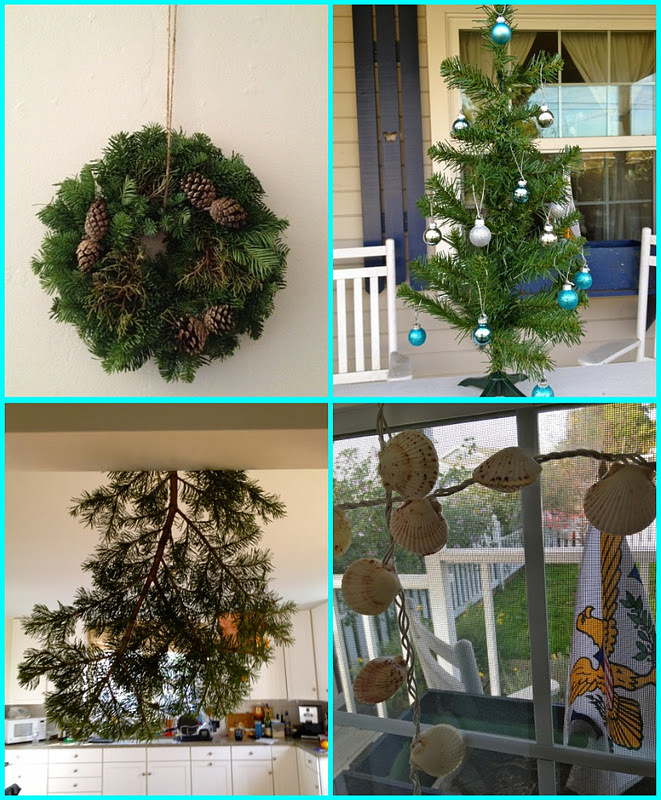 I hope you'll share these sweet decorations at our Coastal Christmas blog party (going through Dec. 24th). Very cute. I have a little Charlie Brown Christmas tree that I drag around with me when I am not home for the holidays. And it has little seashell ornaments on it. Yay for shell lights! Hmmm my easy way of decorating? I tend to do things the hard way lol. I guess the easiest thing I did this year was put poinsettias above my kitchen cabinets and Christmas lights everywhere!! Love your little bit of Christmas! so happy to see your comments on the blog today! Hope you are having a fabulous Thanksgiving weekend.